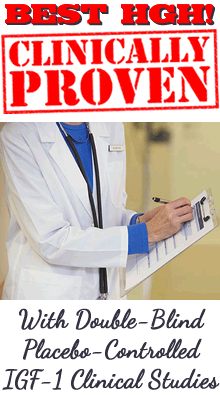 HGH Product 90 Day Guarantee Scams - Beware! Some Will Only Take Back Unopened Bottles! Some companies claim to offer a "no risk unconditional 90 day 100% money back guarantee" on their HGH products. 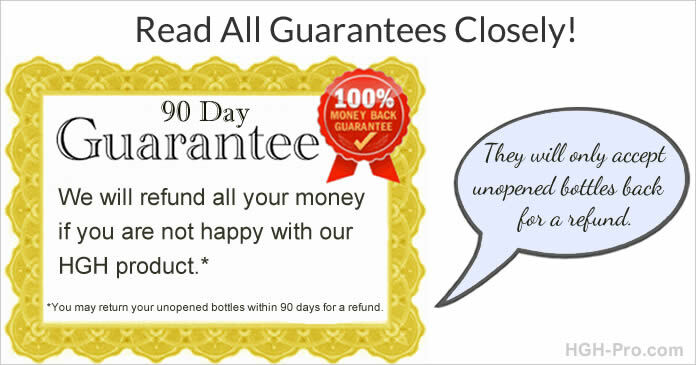 They want customers to believe they can try their product for 90 days and then return all the opened and/or empty bottles for a full refund if it doesn't work but they cannot. They will only take back unopened bottles. They claim to offer you the most but they are really offering you the least of any guarantee. They do not want you to realize this about their guarantee. In fact one of their main selling points may be their 90 day guarantee. They brag about their guarantee on every page of their site yet they only say the bottles must be unopened on their one ordering page (in small print). They know that by the time customers click to place their order they will have already read about their 90 day guarantee on all their other web pages so they will not pay attention to what appears to be just another copy of the same guarantee policy on the ordering page. They make sure their guarantee policy is in the same place and looks the same on every web page. This way customers will not notice that the word "unused" or "unopened" has been added to their guarantee wording only on the page where they place the order. They do this so the company can prove the customer was exposed to their real guarantee wording if he placed the order and he should have read it closely. Those who purchase their product and then ask for a refund will surely learn the sad truth when the company refers them to their policy which states that only unopened bottles may be returned for a refund. Their customers pay the postage to have the bottles shipped to them and they pay to return any unopened bottles so their guarantee costs them nothing and they were able to sell any bottles the customers opened. They just ship out the unopened returned bottles to someone else. Their misleading guarantee works very well for them but not for their customers! We Don't Try To Trick or Mislead You! If you purchase any of our hormonal or anti-aging sprays from us we will take back all your unopened bottles for a full refund for up to 90 days just like our competitors do, but we will also take back one empty bottle, so you can try our product for one month. If you purchase only one bottle, which is a 30 day supply, we will take back your one opened or empty bottle for a full refund during the first 30 days. Take Our 90 Day Challenge! We believe our products work very well if they are taken as directed for the recommended 90 days. For that reason we aren't afraid to put them to the test using blood tests to measure effectiveness. If you want to try any of our products for a full 90 days and receive a full refund if it doesn't work please click below to go to our guarantee policy page. There we explain about our 90 Day Challenge works.